After describing the horrifying evening when he was informed that his daughter was the target of a kidnapping plot aimed at undermining his peace building efforts in Costa Rica, John Paul Lederach wrote the following paragraph:I can no longer take John 3:16 as a short formula for salvation. I can only understand it as a foundational principle of reconciliation. It is an ethic based on willingness to make the ultimate sacrifice on behalf of an enemy. It is an ethic undergirded by and made possible only through the immeasurable love and grace of God.This statement is pivotal to Lederach’s approach to conflict resolution which involves approaching your enemy in the hope of understanding him and finding common ground rather than attempting to force him into accepting your point of view.When my son, Christian Piatt, first recommended this book to me, I told him it would probably be over my head. I’m a lazy intellectual, and I have to keep reference sources close at hand when reading a lot of what he reads, as well as some of what he writes. He assured me that Reconcile was written in a narrative style that makes it an enjoyable as well as an educational read. He was right. Lederach’s stories draw the reader into the personal lives of his own family and of those he has met in his ministry of reconciliation while also teaching how to find the truth, justice, mercy, and peace that are so lacking in our conflicted world.I was further concerned that, since Lederach’s work is global in scope, his insights would have little practical application for a small-world person like me. While I am aware of the chaos that makes up the nightly news, and I attempt to vote and live in a responsible manner, my primary focus is geared more toward the people whose lives touch mine on a more personal level, both here in small town America and on the Internet where my life intersects with others through my writings and theirs. 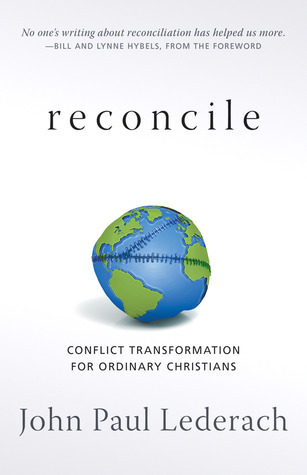 However, the path to conflict transformation outlined in Reconcile is applicable to individuals, churches, and workplace environments as well as an international setting.Christian recently posted an interview with the author on his blog. Following is his last question and Lederach’s answer.If you had one dream for the impact this book would have, what would it be?That it provokes reflection and meaningful conversation that leads to taking a risk, maybe a small step, toward building better, more healthy relationships in and through the many conflicts life affords us.This book is an interesting read but not an easy one. It’s not one to be scanned and put back on the shelf. Instead, it is a text to return to often, to meditate over, to share in a group study. If enough of us read, understand, and live these truths, perhaps Lederach’s dream will come true. Reconciliation: The Grand Purpose of God & CreationI was referred this book while working for a group in Dallas called "Seek the Peace". Jason Clarke, the leader of that group, told me that this book really shaped his personal thinking as well as the vision for his group in Dallas that serves refugees. It took me a while to read the whole thing, but wow! Lederach has insights in this book that I believe are a very healthy way to view the Bible, the Gospel, people, & our purpose in this world. I wouldn't say his thoughts are the most earth shattering things that no one has said before him, but I would say that he gives some very practical ways to have healthy relationships with ALL people, and the humble attitude that he approaches in talking through these issues reminds me of the true character of Jesus. Lederach's views on conflict and it's important & unavoidable purposes in both personal friendships & groups have been really helpful for me as I process my personal, previous experiences with conflict. I highly recommend! The writing integrates biblical lessons and stories from Lederach’s work in conflict transformation. This carefully written book could be beneficial to any individual or congregation willing to take seriously the healing message of reconciliation. The vision presented in Reconcile has grown out of years of work with people in conflict, and out of careful reading of the gospel message of Jesus. With an Anabaptist theological perspective, Lederach expresses a commitment to following the example of Jesus in his actions.For my complete review, see my blog light to read by. I read the earlier version years ago and it is just as powerful now. I especially hear the four voices in a conflict (the Meeting Place chapter), Truth, Mercy, Justice, and Peace again and again as I read the news and engage in controversial conversations among friends and colleagues. The additional resources included in the back are a valuable way to further engage the book and see how these concepts manifest in the church and church-like organizations like Christian Higher Education.I would recommend this book to anyone. I found this book very intriguing and thought provoking. It was not an easy read. You had to be very focused. I had to re read many parts of the book for clarification. I am looking forward to discussing this with my book club. It would be an ideal book for an adult faith discussion. There are not enough stars for this book! Peacemaking Christians and those that want to be more intentional about handling conflict will love it. Those on the fence about the idea may also be taken with it. A thought-provoking book that we read and worked through in our Sunday School class. Wonderfully insightful book written by a man who works in international peace negotiations. Great Biblical comparisons. John Paul Lederach - John Paul Lederach is Professor of International Peacebuilding at the University of Notre Dame, Notre Dame, Indiana, and concurrently Distinguished Scholar at Eastern Mennonite University. He has written widely on conflict resolution and mediation. He holds a Ph.D. in sociology from the University of Colorado. In 1994 he became the founding director for the Center for Justice and Peacebuilding at Eastern Mennonite University where he was a professor.